Thomas the Tank Engine is here to make your child's party even more spectacular. If your child likes Thomas then load up on some fun with this Thomas The Tank Engine Full Steam Ahead train birthday party theme. Items include: dinner (lunch) plates, dessert (cake) plates, set of red forks and spoons, luncheon napkins, beverage napkins, cups, table covers, invitations, thank you notes, blowouts, cone hats, solid color balloons, stickers and more. Climb aboard and ride the train with Thomas! Need Thomas the train cake topper and decoration items? Please visit our Train Cake Pans & Decor section for Thomas the Tank Engine train cake decoration kits and related items. Huge Sale! 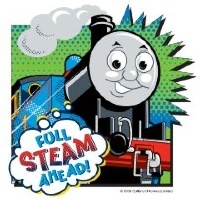 See our Thomas The Tank Engine Books, DVD's, Engines & Playset, and Greeting Cards. Hurry! Limited Quantities... While Supplies Last!